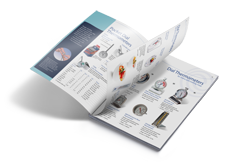 Comark has a wide range of Meat Dial Thermometers, suited to a variety of applications. 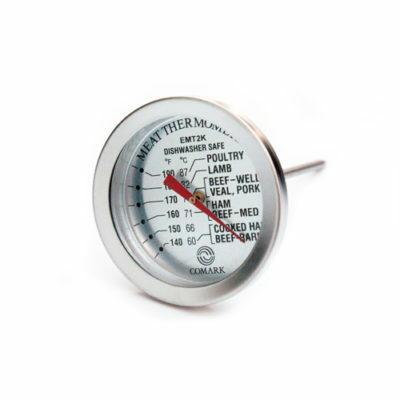 The selection below represents the Meat Thermometers from the Dial range, specifically designed for Meat applications. 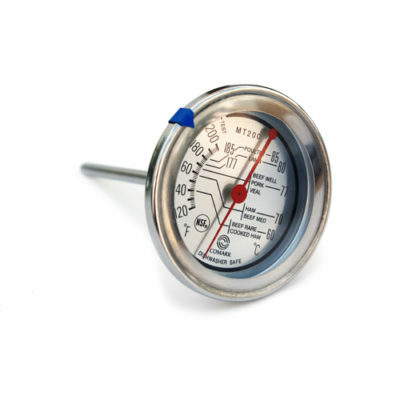 The EMT2K Economy Meat Thermometer has a stainless steel body, bold numbers for easy reading and dual scale measurement. The MT200K Meat Thermometer with Safe Cooking Temperature Zones can be inserted into the food at the beginning of the cooking time and remain there throughout cooking. 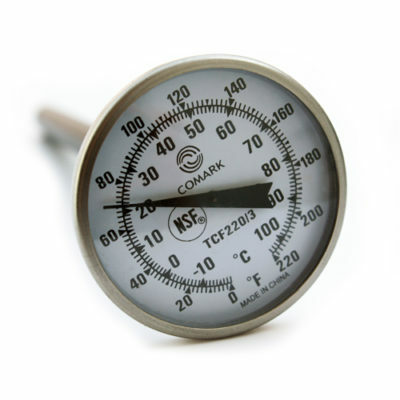 There are two main types of meat thermometer that are described by their method of use. In oven thermometers, as the name suggests, are put into the centre of the meat and put in the oven along with the meat. The temperature dial facing the oven door to be read easily. External meat thermometers are used once the meat has been removed from the oven but before the meat is rested. When using an external meat thermometer, the timeliness of the reading and the placement of the probe are of paramount importance. Analog meat thermometers are the most common. A dial display graduated by temperature and, in some cases, by the recommended cooked temperature of the type of meat being prepared. Digital meat thermometers tend to be of the external type only. Providing a quick read digital display of the temperature. In all cases the correct placement of the probe is a vital consideration. How to Use a Meat Thermometer. Push the thermometer probe into the thickest part of the meat away from any bone. The thickest part of the meat will have the lowest temperature penetration during cooking. It is important that this part of the meat is properly cooked. With an in-oven solution, the thermometer should be left in place throughout the cooking process. For an external thermometer, the probe should be placed as soon as the meat is safely removed from the oven. It should be done before the meat is rested. Meat thermometers are the safest and most reliable way of measuring the cooked temperature of your meat. Relying on cooking time or meat colour does not guarantee that the meat is properly cooked or safe to eat. A food thermometer is required. The cooking process breaks down proteins and bacteria in the meat itself. The meat will change colour as a result. The texture will also change. Proteins in any bacteria present in the meat will be broken down and the bacteria will be destroyed rendering the meat safe to eat. However, the temperature and duration of cooking required for this to occur depends on the meat itself. The type of meat, the size of the portion being cooked, and the type of oven being used will affect the cooking time. The only way to be certain that the meat is properly cooked is to use a thermometer as described above. The safe temperature of meat varies by type. Minced meat which has been subject to contact with mincing devices and human handling requires a higher temperature before it is safe to ensure the bacteria and impurities added during the mincing process are destroyed. The guidelines are a little different for USA and UK food stuffs. Reheat cooked hams packaged in USDA-inspected plants to 140 °F (60 °C) and all others to 165 °F (73.9 °C). During cooking, heat energy transfers into and breaks down proteins in the food. The meat changes colour from pink to brown or to white. Its texture changes too. Cooking also causes the proteins in bacteria to break up so they no longer function and the bacteria die. This is why cooking removes the risk from harmful bacteria that are in some food. Bacteria usually grow in the ‘Danger Zone’ between 8°C and 60°C. Below 8°C, growth is stopped or significantly slowed down. Above 60°C the bacteria start to die. Time and temperature are both important because proteins need to be heated up for a long enough time for them all to be broken down. Standard advice is to cook food until it has reached 70°C and stayed at that temperature for 2 minutes.